Field Station: Dinosaurs is world-class family attraction located in Derby, Kansas. We combined cutting-edge science with the creative minds of great artists to create a one-of-a-kind experience that's thrilling, educational and fun. Our wild scientific expedition is just minutes south of Wichita, Kansas. We feature over forty life-sized, realistic dinosaurs. Our workshops, games, and activities connect the story of the dinosaurs to our world today giving new relevance to their lives, and power to the tale of their extinction. Our scientists have worked tirelessly to ensure that the exhibition encompasses the latest theories and discoveries in the fields of paleontology, geology, and environmental studies. 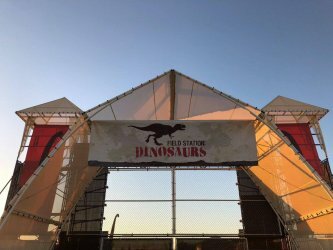 Walk along our trail, check out our life-sized dinosaurs, and participate, in our informative and interactive live shows, workshops, games, a Challenge Dome, and our exciting Jurassic Golf today!